Then she hears a message from Queen Mab. She has the spring fairy ball to plan. She must hide the location from man. And joy in the plan kept. Counting on fingers — only 20 days left. Thanks!! I had fun with this one! and I hope your daughter’s party saw many Faeries dancing and singing ! He was the king of rhyming and re-rhyming. And thanks, I’m glad I managed to channel him, even though I didn’t tip my hand till the end. Only you would see the satellite dish! Now I see it too. We just had an ice storm in McKinney Texas. It was almost 80 yesterday. Yikes! 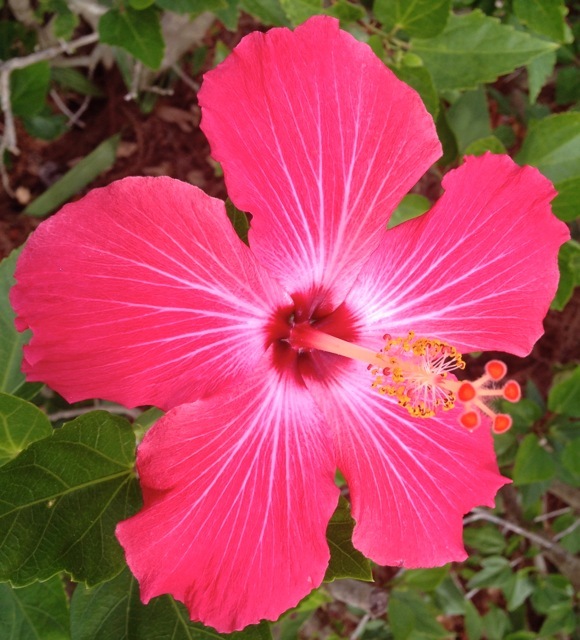 Hibiscus are such enchanting flowers – your words create such beautiful imagery ! What a lovely thought! Sure hope spring is on time, maybe with the fairies in charge, it will be -): Love the hibiscus. Thanks! I hope spring is on time, too. Six more inches of snow due here. Sigh. so cute and i hope i am invited to the ball! I think you’re on the list! LOL Glad you’re flexible. They might decide to only invite other fairies after all. Thanks, the photo inspired me. 🙂 Excitement always keep me warm. My daughter’s fairy princess birthday party is today, and I’m sure that will be warming. We are so lucky to get it in before the snow hits!! Happy Birthday to your Fairy Princess!! Yes, and the music… you have to move and dance, and dance, and eat nothing all night! LOL You’ll have to ask my kids. I’m afraid they prefer hanging out with me to going to school or just about anywhere else. I’m kinda crazy regularly. In a good way, though, I think. And yes, imagination is our game. We would have fun, no doubt. LOL Fun, but with heart. The best kind.